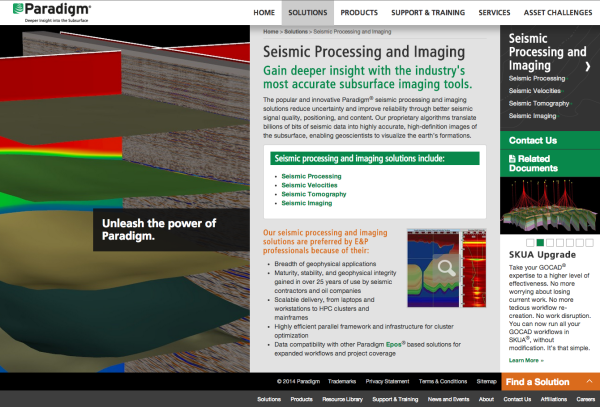 HexaGroup recently launched the redesigned website for Paradigm®, the largest independent developer of software-enabled solutions to the global oil and gas industry. The new website showcases the company’s rich portfolio of productivity tools and scientifically advanced applications through innovative design and web optimized content. Implementing the following best practices for Web writing, HexaGroup set out to better connect users to the site content by tackling the technical, and often complicated, language surrounding the subject of E&P software. Web users read differently than others – as action-oriented readers they scan content, look for key words and phrases, and search for specific information that will help them meet a particular goal. To make Paradigm’s content more Web friendly, HexaGroup worked closely with company experts to develop and edit technical content so that the key benefits of product offerings would be more obvious and accessible to Paradigm’s audience. Improvements in readability and structure were key. The content, which in many cases originally had a Flesch-Kincade Grade as high as 21 and readability of -2, was rewritten to a more accessible Flesch-Kincaide grade and readability. Simplifying the language was only one of our challenges, as we also wanted to connect users to content with fewer clicks, and make sure that content is visible and immediately available. Subheadings were used to group related content into digestible chunks of information that focus on one main idea per paragraph. Bullet lists were also implemented to increase the visibility of product “Features and Benefits” that were previously hidden in tabs. Web readers need to be able to quickly find information they are looking for or they will go somewhere else to find it. Taking this into consideration, HexaGroup’s information architect reorganized the site’s structure to better fulfill user needs and support key business objectives. For example, the site now has connected solutions and product pages, and related content (technical papers, articles, videos) is associated with selected pages. In addition, HexaGroup created the Solution Finder feature for visitors to easily discover information on the appropriate E&P software solution for their specific need. Module boxes detailing related products and solutions were also added to help users easily identify appropriate E&P software for their specific needs. For the Web reader, well written, engaging content on a website isn’t enough. It must be discoverable. If a searcher cannot find content, they never become a visitor much less a customer. Content must be marketable, and it must be optimized for search engines in order to attract visitors looking for the specific information that the website can provide. To improve the SEO of Paradigm’s new site, HexaGroup implemented search friendly URLs and removed duplicated content. We also set out to improve on-page optimization by adding H1 and H2 tags, meta descriptions, and a sitemap. Additional page-specific keywords in the footer were also added to increase keyword count without affecting readability. We also discovered the need to introduce new content to the site map to help visitors identify Paradigm solutions based on drilling environment. The new Asset Challenges section of the site provides more detailed information on product offerings for conventional, unconventional, deep water, and mature fields. The ability to take a complicated subject matter and optimize it for a web audience is just one of HexaGroup’s many Web development services. Are you looking to take your company’s site to the next level with content that can better reach your key customers? We would love the opportunity to speak to you! Contact HexaGroup and let’s schedule a meeting! More than 20 years of access to our creatively diverse and highly skilled team has built long-term client relationships. Along the way, we have become much more important to their success than just being a good digital agency. We have become an integral partner in the success of our clients, as an innovative outsourcing resource and a unique team of highly skilled creative and technical consultants. They trust us to deliver – every time, on time, with exactly what we promise.